Leadership Corpus Christi is a 10-month intensive training program for emerging and existing leaders; LCC builds the needed skills, knowledge, motivation and vision to develop a stronger community. 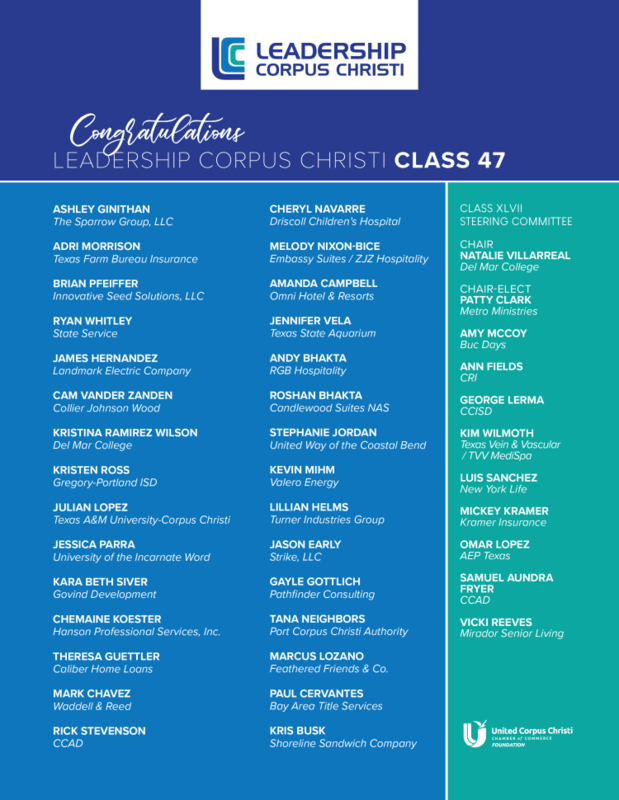 Established in 1972 by the Corpus Christi Chamber of Commerce, the program is the third-oldest community leadership program in the country. Over 1,300 graduates are having a powerful impact on virtually every community and business organization throughout Corpus Christi. LCC provides access to high level CEO's and government officials; educates participants on Corpus Christi's past, present and future; provides a networking opportunity unlike any other; and utilizes training and professional development tools such as StrengthsFinder and DiSC. Program sessions occur monthly from August through May. For more information on Leadership Corpus Christi, Contact Cecilia DuPree, Chamber Foundation Program Specialist, at (361) 881-1800 or cecilia@unitedcorpuschristichamber.com.